As a cold blooded, heartless, ruthless, and soulless career criminal during my Crazy Eddie days, I learned to always accentuate the positive and deflect from the negative in my dealings with Wall Street. 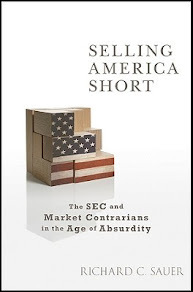 I hardly ever faced an effective questioner whether the person was a Wall Street analyst, investment banker, or auditor. Rarely was I asked good follow up questions. During Overstock.com's recent earnings conference call for the second quarter of fiscal year 2007, Overstock.com's management gave a hyped up explanation of the company's so-called turnaround. The representations of Overstock.com's management went unchallenged and important questions were not asked. I guess that not much has changed since my criminal days at Crazy Eddie. As I listened to Patrick Byrne's delusional rants during the conference call, I was reminded of the movie, "The Silence of the Lambs." Well, Patrick Byrne frequently uses the alias Hannibal on internet message boards. 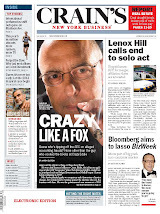 His silent lambs were the Wall Street analysts that attended the earnings (or rather lack of earnings) conference call. As investigative reporter and blogger Gary Weiss noted, during the conference call, Patrick Byrne was so bored that he posted a message on InvestorVillage thanking his antisocialmedia.net smear web site contributor, Overstock.com shareholder, and proud corporate shill, Evren Karpak. After the conference call, the Overstock.com spin machine, led, Evren Karpak, rallied the troops on internet message boards, posted glowing assessments of the company, and roundly smeared Byrne's perceived enemies. Judd Bagley, the cyberstalking Director of Communications at Overstock.com and administrator of its antisocialmedia.net smear web site, recommended various stock pumping posts by Evren Karpak, on the InvestorVillage message board, using his alias De Daumier-Smith. Here is a link to posts on InvestorVillage that were recommended by Judd Bagley. The day before the conference call, Overstock.com's (OSTK) stock closed at $17.61 per share. In the days that followed, the stock climbed above $20 per share. A close examination of Overstock.com's financial disclosures paints a starkly different picture than Patrick Byrne's hyped up improvement of Overstock.com's financial results. Therefore, adjustments made under Generally Accepted Accounting Principles to reduce inventory values below cost to market value in prior periods have the effect of increasing gross margins in future periods. While a company properly follows GAAP by taking immediate write-downs of reduced inventory values, the side effect is that margins in future periods are increased as the junk inventory is sold. In other words, by recognizing your inventory screw ups immediately under GAAP, you increase your profits in future periods. In the first quarter, a company buys merchandise for $120, its books and records will reflect $120 of inventory. In the second quarter, the company, under GAAP, reduces the value of its merchandise by increasing inventory reserves by $50 to reflect diminished future demand and market conditions. Therefore, in the second quarter, the company reduces its gross margins by $50. The net inventory book value on its balance sheet is reduced to $70 (original cost $120 less $50 inventory reserves). In the third quarter, the company sells the merchandise for $90. Since the net value book value of the merchandise was previously reduced to $70, (as a result of taking a $50 reserve against its original purchase price of $120 in a previous quarter), the company recognizes gross margins of $20 (Sales $90 minus net book value $70). The company, under GAAP, had gross margins of $20 in third quarter after selling the previously written down inventory. It would seem on its face to be an improvement over the reduction of gross margins by $50 in the second quarter resulting from the inventory write down. However, in reality the company lost $30 on its merchandise. The original cost of the merchandise was $120 and they sold it for $90. Therefore, taking inventory reserves increases future gross margins. Increased future gross margins resulting from taking inventory reserves in previous periods does not necessarily reflect an underlying improvement in economic performance. As a company sells such inventory in future accounting periods, it simply reduces inventory reserves taken in previous accounting periods and recognizes additional gross margins. At the end of Overstock.com's first quarter of fiscal year 2007, inventory reserves totaled about $6.5 million or a whopping 28.1% of the gross inventory of about $23.2 million. Had that entire inventory from the first quarter been liquidated during the second quarter at its original cost basis, Overstock.com would have had record gross margins of 28.1% or $6.5 million before certain allocations to cost of goods sold. In the second quarter of fiscal year 2007, Overstock.com’s gross inventory (before reserves) dropped from about $23.2 million at the end of the first quarter to about $19.2 million at the end of the second quarter. There was a sizable drop in inventory reserves from about $6.5 million at the beginning of the quarter to about $3.8 million at the end of the quarter. The percentage of inventory reserves to gross inventory declined from about 28.1% to about 19.8%, a level still significantly above every period prior to the last quarter of fiscal year 2006. Despite Overstock.com's massive increases in inventory reserves in previous quarters and now a substantial reduction of those reserves during the current quarter, no one asked any questions about the impact of the company's reduction of inventory reserves on gross margins, operating losses, and EBITDA. Overstock.com was not volunteering any information. Overstock.com played up the improvement in its gross margins as signs of a major turn around without explaining the effects of its reduction of inventory reserves on increased gross margins, reduced operating losses, and improved EBITDA. In fact, Overstock.com's reduction of inventory reserves in the second quarter was about $2.7 million. The company's operating losses dropped by about $2 million from the same quarter of the previous fiscal year. 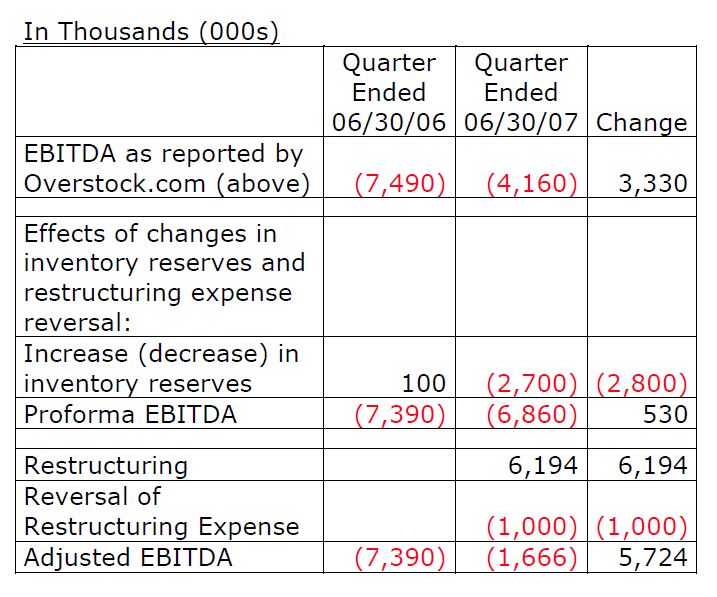 Therefore, Overstock.com's entire reduction in operating losses for the second quarter of fiscal year 2007 can be attributed to its reduction in inventory reserves. Surely, Patrick Byrne, who used conveniently used pro forma adjusted non-GAAP numbers to hype Overstock.com's purported turn around, could have explained how book keeping entries involving inventory reserves produced increased gross margins. In addition, we cannot discount the possibility that inventory reserves booked by Overstock.com in previous quarters and in the current quarter is accurate. Therefore, if Overstock.com took excessive adjustments on inventory to reduce its value below market in prior periods, gross margins would be inflated in future periods. Likewise, if a company understates reserves, it inflates gross margins during the current period and reduces gross margins in future periods. We do know that Overstock.com has made inconsistent and contradictory disclosures in the past about it inventory reserves and gross margins, which is the subject of part 2 of this blog post. In addition, we know that Patrick Byrne is the target of a Securities and Exchange Commission probe into financial disclosures and other issues at Overstock.com. We don't know the extent to which the reduction of inventory reserves during the second quarter of fiscal year 2007 resulted from the reversal of previous adjustments to market value or the reduction of previous excessive reserves. However, we do know that the reduction of inventory reserves during Overstock.com's current quarter reflects the reversal of previously booked adjustments (whether or not excessive), which increased gross margins, and does not necessarily represent an underlying economic improvement. The resulting increase in gross margins from any reversal of inventory reserves increases operating income and EBITDA. During the second quarter of fiscal year 2007, Overstock.com reduced its inventory reserves by $2.7 million which resulted in an increase in gross margins, reduction in operating losses, and improvement in EBITDA of the same amount. During the second quarter of 2007, the Company reached an agreement to terminate the Indiana warehouse facilities lease in its entirety effective August 15, 2007 for $1.9 million, resulting in a reversal of restructuring expense of approximately $1.0 million. 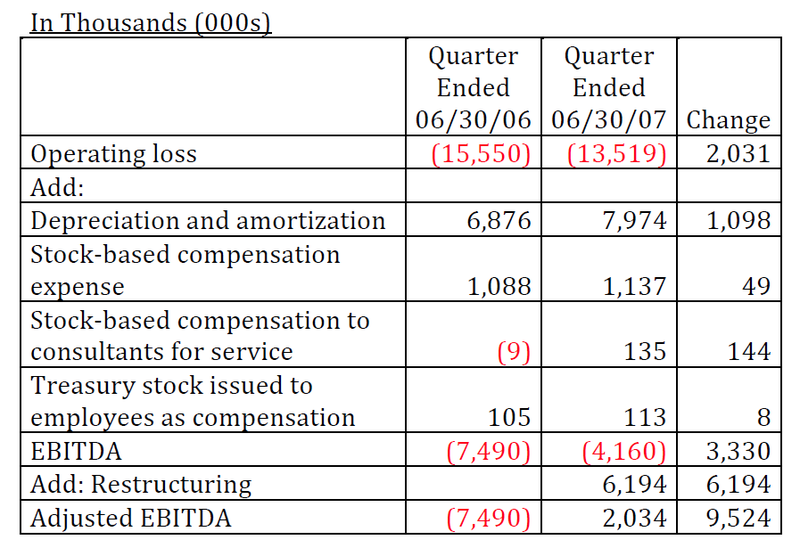 The "reversal of restructuring expense of approximately $1.0 million" resulted in increasing Overstock.com's pro forma aka "adjusted" EBITDA by $1 million. 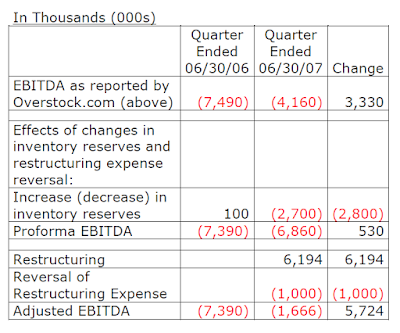 Taking into account the reduction of inventory reserves and reversal of restructuring costs during the second quarter of fiscal year 2007, Overstock.com's EBITDA improvement mostly disappears and its EBITDA and pro forma aka "adjusted" EBITDA becomes a negative amount. Overstock.com simply adds back allegedly "nonrecurring" expenses, but fails to deduct certain one time benefits. As a minimum, Overstock.com should have disclosed the nature of the material contribution resulting from the reduction of its inventory reserves in reducing operating losses and improving EBITDA in the MD & A section of its 10-Q for the second quarter of fiscal year 2007. In addition, it should have prominently highlighted the material effect of its reversal of previous restructuring charges in its pro forma aka "adjusted" EBITDA. I guess Patrick Byrne uses EBITDA when it is to his advantage to hype Overstock.com's financial performance. He uses a non-GAAP pro forma aka "adjusted" EBITDA to promote the company while ignoring the effects of reductions in inventory reserves and reversals of previously booked and so called "nonrecurring" expenses. Overstock.com never came close to crossing the "billion-dollar mark" for fiscal year 2006. Its revenues ended up at about $796 million for the fiscal year. Despite Patrick Byrne being "comfortable" with "an EBITA-profitable" year for fiscal year 2006, Overstock.com EBITDA fell far off the mark. I guess Patrick Byrne needed more than a "little luck." 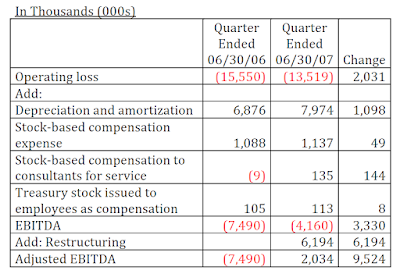 In addition, Overstock.com's use of EBITDA and pro forma aka "adjusted" EBITDA during the 2nd quarter of fiscal year 2007 ignores the underlying quality of current reported earnings. Patrick Byrne hypocritically uses "a phony accounting standard--pro forma" when it pleases him. So, whose non-GAAP pro forma aka "adjusted" numbers are more meaningful, the delusional paranoid Patrick Byrne, who is a target of a federal investigation, or this convicted felon and former CPA? When a public company uses non-GAAP pro forma numbers to hype up its results, there is always a slippery slope as to what to include and not include in its calculations. If you believe EBITDA is profitable and you believe that the restructuring charges really are one-time, or they are not recurring and that's your definition of pro forma then we were $2 million profitable this quarter. We've recovered and we're actually EBITDA positive in the ... second quarter. Worst yet, is that Overstock.com’s purportedly “nonrecurring” charges have been increasing at an increasing rate. For example for fiscal year 2005, so-called “nonrecurring” charges for discontinued operations totaled about $2.5 million. For fiscal year 2006, “nonrecurring charges” from discontinued operations totaled about $6.9 and restructuring charges totaled about $5.7 million. During the first six months of fiscal year 2007, Overstock.com’s “nonrecurring” charges for discontinued operations totaled about $3.9 million and restructuring charges totaled about $12.3 million. The company has continuously engaged in highly speculative and money losing ventures that continue to this day. Overstock.com has gone through frequent and continuous changes in its operating structure which has led to consistent charges for restructuring and discontinued operations as cited above. Such speculative ventures have included OverstockB2B, collaborative filtering, m-commerce, Travel, Auctions, and Design Your Own Jewelry. All of these speculative ventures have produced losses and consumed significant amounts of shareholder capital. Newer speculative ventures such as Omuse have not produced any profits. Despite previous statements by Overstock.com, Omuse has yet to come out of beta. It is highly misleading for Overstock.com management to make profitability assertions based on a non-GAAP measure such as EBITDA excluding restructuring charges. In addition, the reduction of inventory reserves and reversal of previous so called “nonrecurring” restructuring charges had a material impact on EBITDA and proforma aka “adjusted” EBITDA whose effect went undisclosed in Overstock.com’s calculations and disclosures. I analyze certain disclosures by Overstock.com and statements by management about gross profits margins, inventories, and inventory reserves and raised the question as to whether the company is using inventory reserves to manage earnings.